Emily Anding ’12 has been chosen by the Fellowships at Auschwitz for the Study of Professional Ethics (FASPE) to participate in a two-week program in Germany and Poland this summer. 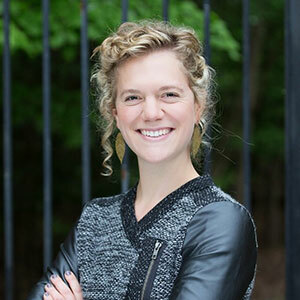 Anding, who graduated from Colorado College with a degree in environmental policy, currently is in her second year at the College of William & Mary’s Raymond A. Mason School of Business, where she specializes in design and innovation. She is one of 12 business students selected for the program, which examines the conduct of executives and managers in Nazi-occupied Europe as a way to reflect on ethics in business and leadership today. Before pursuing her MBA, she worked in the fields of higher education and college access. Anding joins a diverse group of 63 FASPE fellows across five fields — business, journalism, law, medicine, and seminary — who were chosen through a competitive process that drew close to 1,000 applicants from around the world. The program is geared toward graduate students in professional schools as well as early-stage practitioners in the five designated fields. The program examines the roles played by business executives and their enterprises in the Nazi state, underscoring the reality that moral codes governing corporate action and business leaders can break down or be distorted with devastating consequences. With this historical background, the program’s founders believe the fellows are better positioned — and more willing — to confront contemporary ethical issues in their professions. After the program, each fellow will submit an essay focused on an ethical issue of his or her choice. Select essays are published in the annual FASPE Journal, which showcases work in all five disciplines.